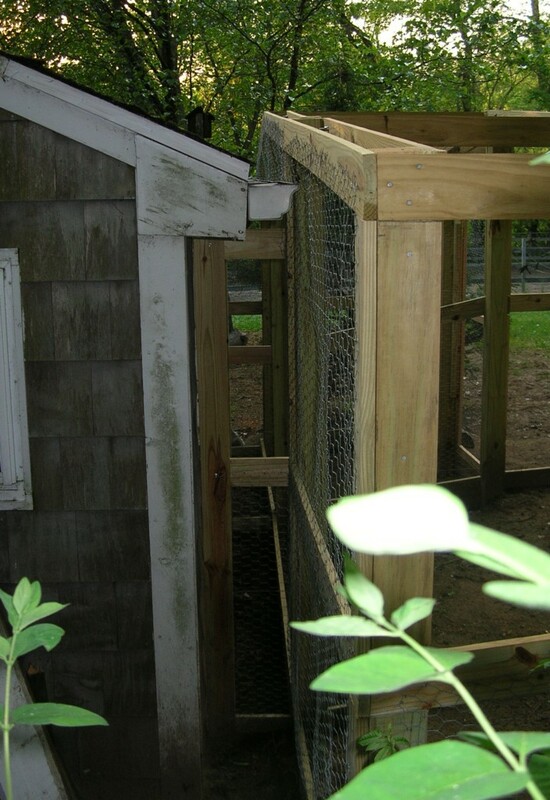 We got our first chickens in 2006, and a family friend made a small chicken coop in the shed attached to the rear of our barn, with a small run outside. 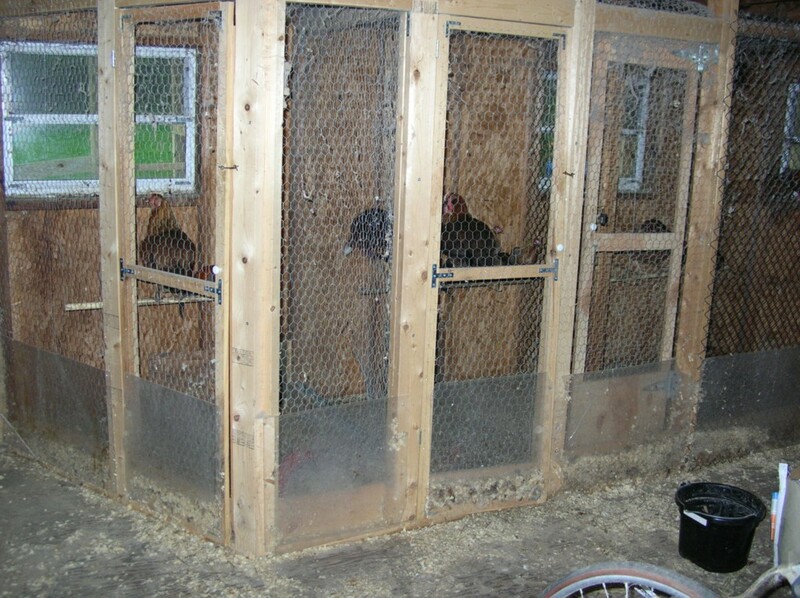 In 2007 we got some more chickens and I extended the internal living space to have two more separate living quarters. I also constructed a larger run for them. 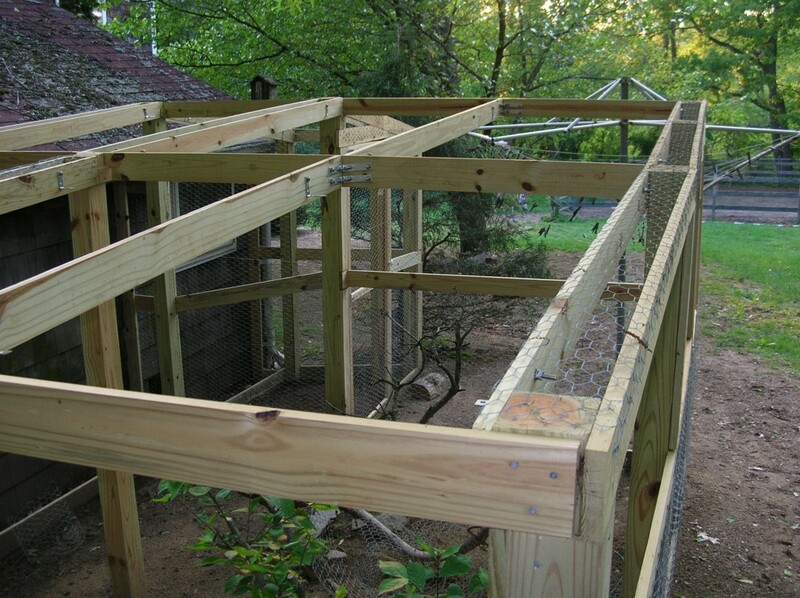 This was the Mk-I chicken run, which I finished in June 2007. Here are a couple of pictures taken just after I finished making it. The original outdoor run (the one that I did not make) is only just visible to the left of the second picture. In the pictures, the roof looks weird because of the slope of the ground: nothing is level. 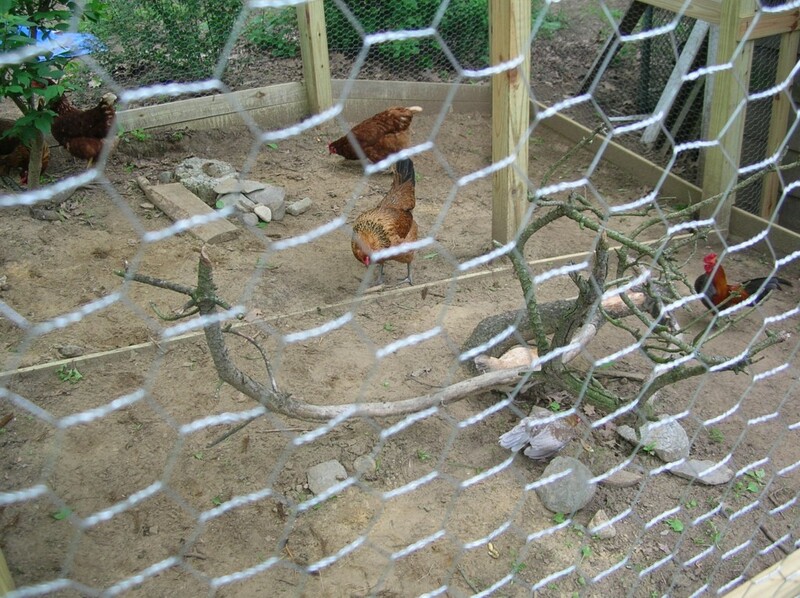 It was made with metal posts banged into the ground, and chicken wire wrapped around them. Wooden boards were sunk into the ground at the base of the walls to prevent animals from digging in. It was not very tall, being about 4' high. 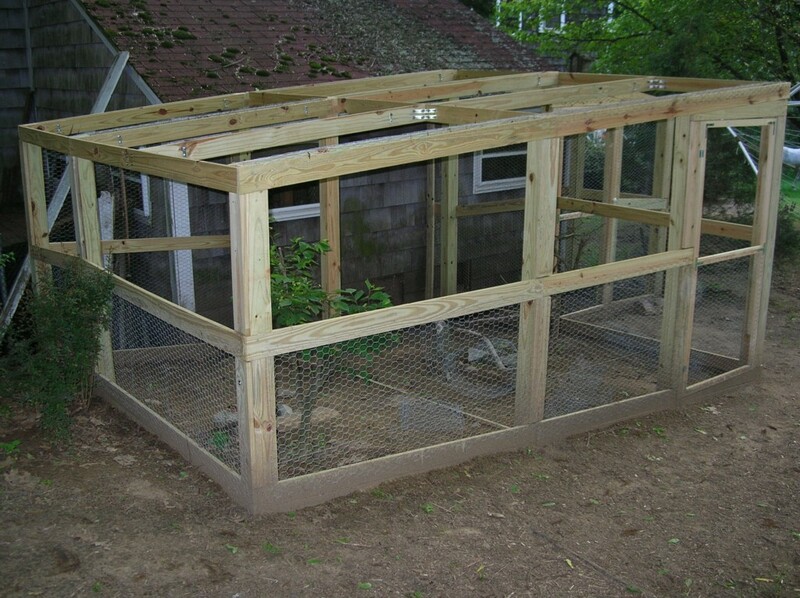 1"x2" wood provided support for the wire roof (bolted to the tops of the metal posts using brackets), and with two wooden doors providing access from the outside. 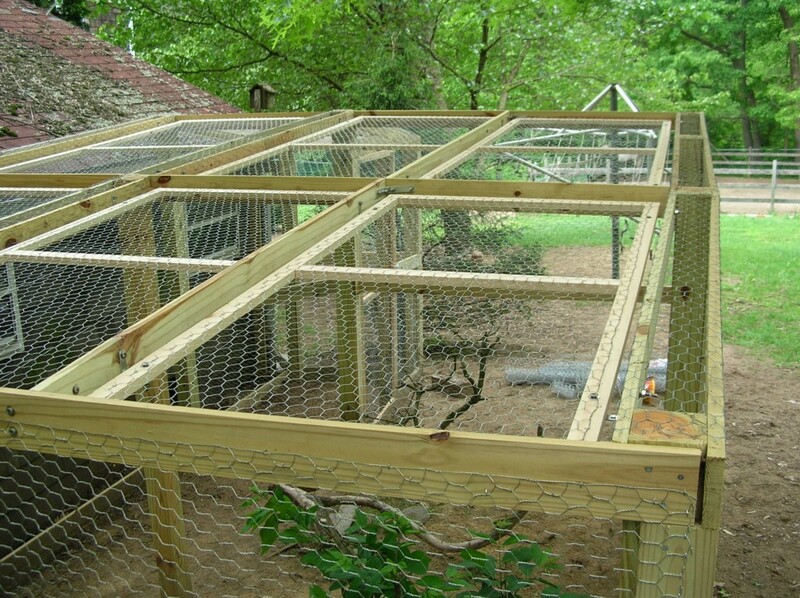 This picture shows chicken run Mk-I with Emma and Marcus for an idea of scale. Mk-I turned out to be rather flimsy. After all the snow we had in the winter of 2010, the roof of the run buckled and broke under the weight. So I needed to make a new one. Mk-II needed to be sturdier, and able to withstand snow being piled on top. Another consideration was that I could not previously get at the gutter on the edge of the shed roof to remove leaves, so I wanted to be able to access it by having some form of removeable roof. I used Google Sketchup to plan out the new run. A rather steep learning curve for this, but it was fun to do. It allowed me to design and view the run in 3D, using the mouse to rotate the image around. Here is how my plan ended up, though during construction I did alter the design a little; contrast the plan with the pictures after finishing. Materials and tools, listed in no particular order. treated wooden posts: 8' x 4"x4"
treated wooden boards: 8' x 1"x4", and 8' x 1"x8"
wood for doors and roof panels: 6' x 1"x2"
Around $100 for metal brackets, nuts, bolts, washers, etc. I first had to demolish the Mk-I run. This took a couple of weekends, pulling off the old rusty chicken wire, pulling out the old bent metal posts, and digging up the old wooden base boards. A trip to Home Depot to buy materials (the first of several trips) and I was ready to start. I used my local hardware store O'Connors in Billerica, (near work) for some items too. After all the scratches I received pulling off the old chicken wire, I realized I had not had a tetanus shot for some years, so stopped off at the doctor's one morning for one. I started by digging holes for the posts with the post hole digger. I aimed for a depth of about 14". Most holes ended up between 14" and 18" deep. Watch out for tree roots! I had to use the Sawzall to trim some roots away. I positioned each post and when I was happy with the depth, I braced it in position temporarily with a couple of lengths of 4" board clamped to the post. When another hole was in position, I braced it too, and clamped a board between the posts to support them both. Once I had positioned a few posts, and was happy with their verticalness, I nailed a board across the top of two of the posts. I only used one nail at each end at this stage, and didn't nail it all the way in. I would only do that when I had finished all the boards and was certain everything was level and square. All nail holes were drilled first to prevent the wood from splitting. Once I had nailed boards all around the top of the run, I started to dig a channel out along the bottom all around, so that I could nail 8" boards at the base to prevent animals from digging in (or out). The 8" boards were buried to almost their entire width, so I nailed a second row of 4" boards on top of the 8" boards. This helps to keep the dirt in. At this point, the run structure was pretty solid and square, so I went around and finished off nailing in the not quite fully nailed in nails, and added a few more at each joint for strength. For neatness (and also to allow me to use a 3' wide roll of chicken wire and not the more expensive 4' roll), I nailed 4" boards around the middle of the run. Of course, I kept the two doorways clear. 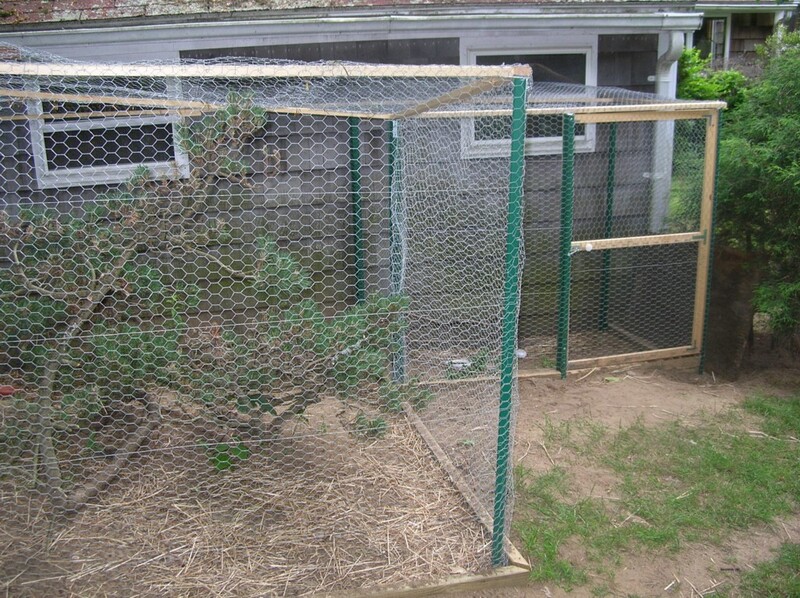 4" boards were attached to the posts between the horizontal boards, to provide a continuous surface to attach the chicken wire to (not shown in plan). Remember I needed access to the shed's gutter, so I had to position the rear wall of the run about 12" away from the shed. Three filler pieces were made and screwed to the posts at the rear to provide a barrier here. At this point the framework is now complete. I used the Sawzall to trim the tops of the posts to the height of the roofline for neatness. 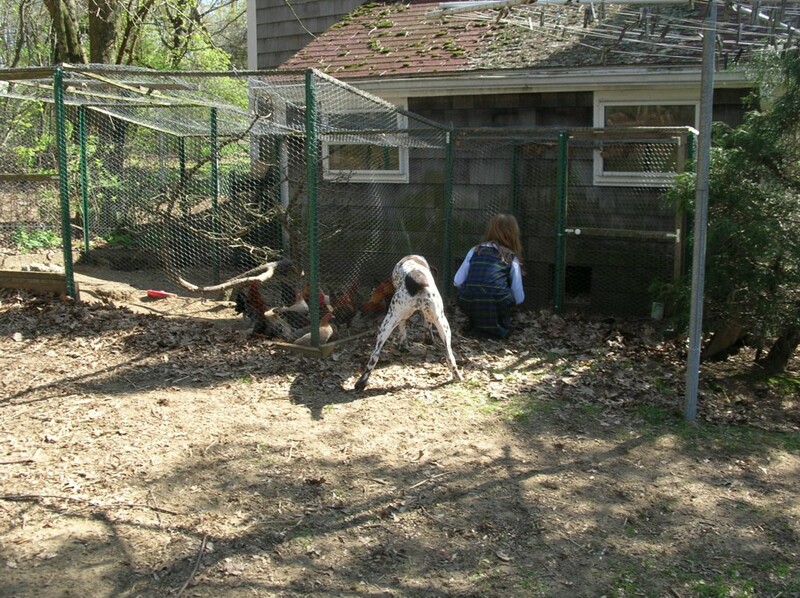 Without doors, the chickens will escape. I made the two doors from 1"x2" wood, with metal corner braces and T-pieces. A couple of pairs of hinges, and they were up in no time. A gatehook and handle and they were finished. The doors are not shown in the plan, but the openings are. During construction I did move their positions so that the opening was next to the highest posts, making it a little taller. I found that either the door or the opening was not quite square and the door did not close without catching against the corners of the opening. The simplest solution was to trim a little off the top and bottom corners of the door to get a better fit. 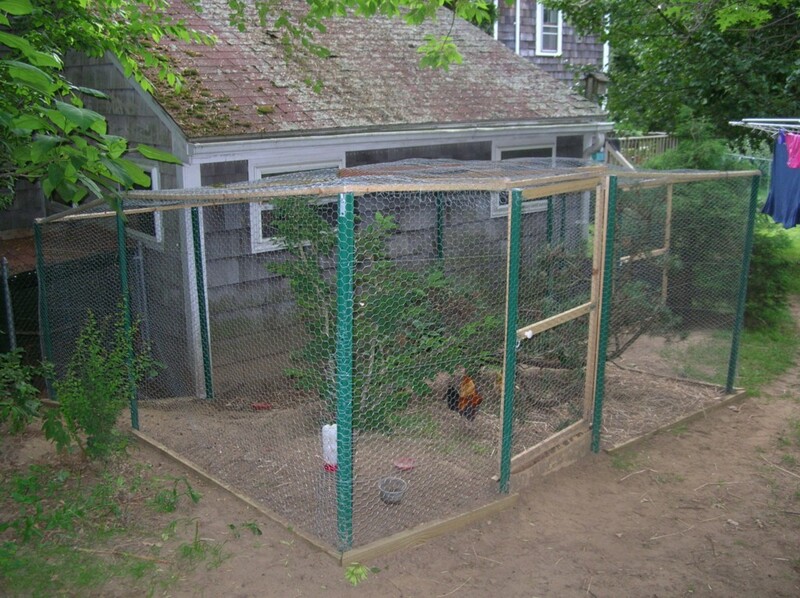 The chicken wire was attached one section at a time. 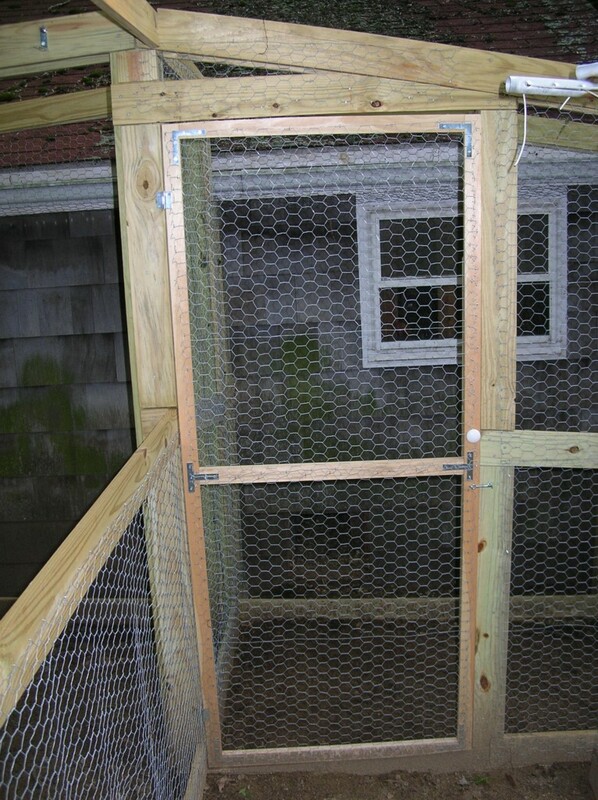 Each section was measured and an appropriate size piece of chicken wire was cut from the roll. Use some pieces of the post offcuts to weigh the end of the roll down as you measure and cut. Watch out for the sharp edges of the wire as it tries to wrap itself around you! The wire was stapled to the wooden frame. 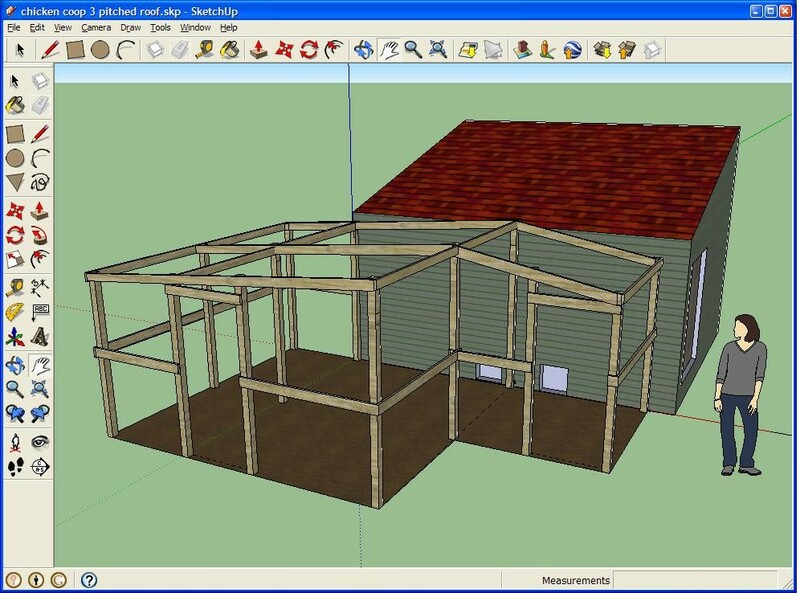 The roof is not shown in the plan, as at the time I hadn't quite decided how to make it. 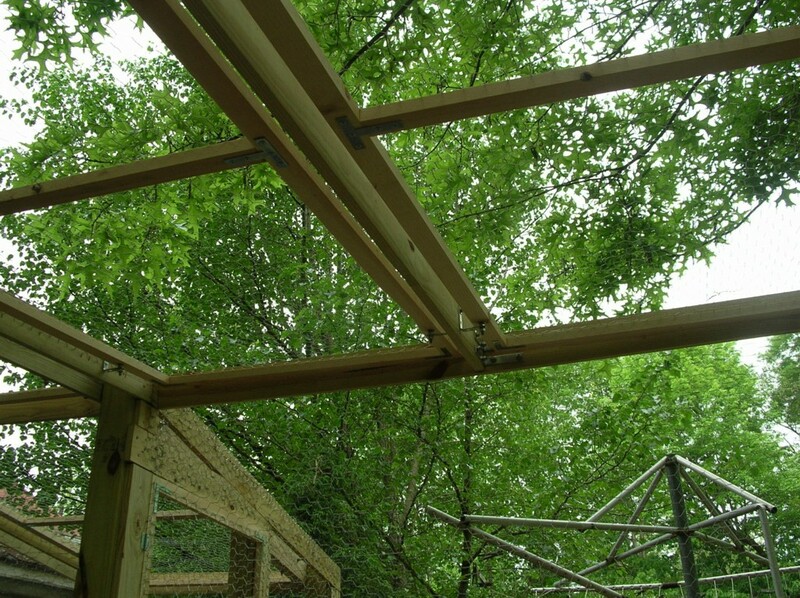 A center span was added to the roof to reduce the width of the panels required to fit. This was attached via bolts and brackets. 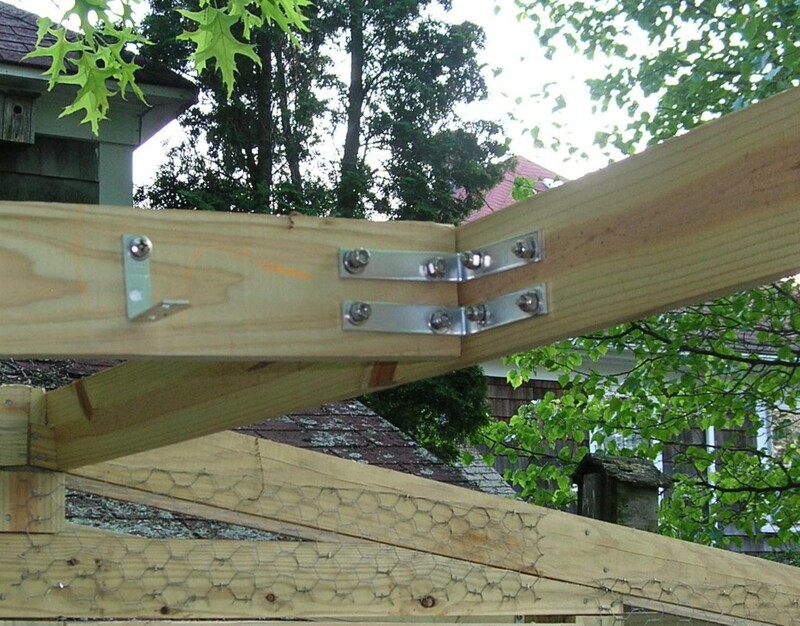 L-shaped metal brackets were attached to the pieces of wood forming the roof edges. 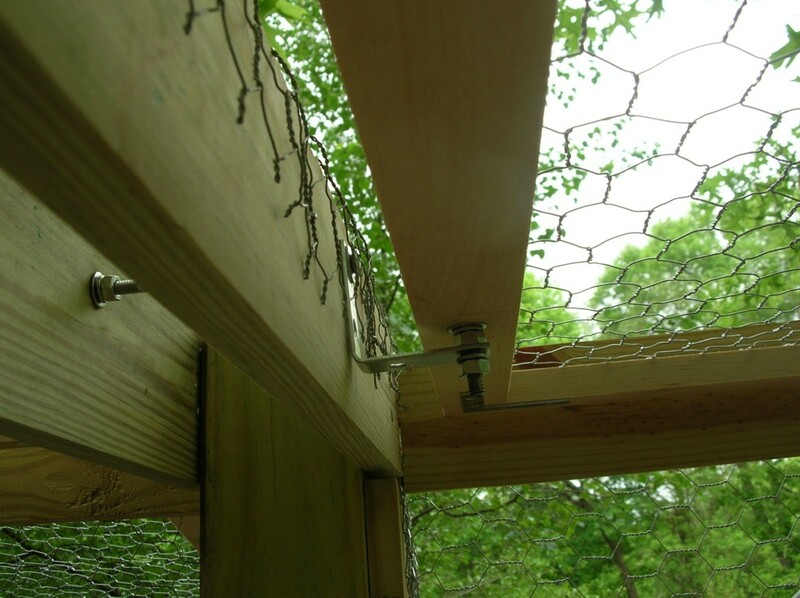 These are to support the removable roof panels. These pictures were taken before the roof panels were constructed. You can just see a couple of brackets in the lefthand picture below; a closeup is in the picture on the right. 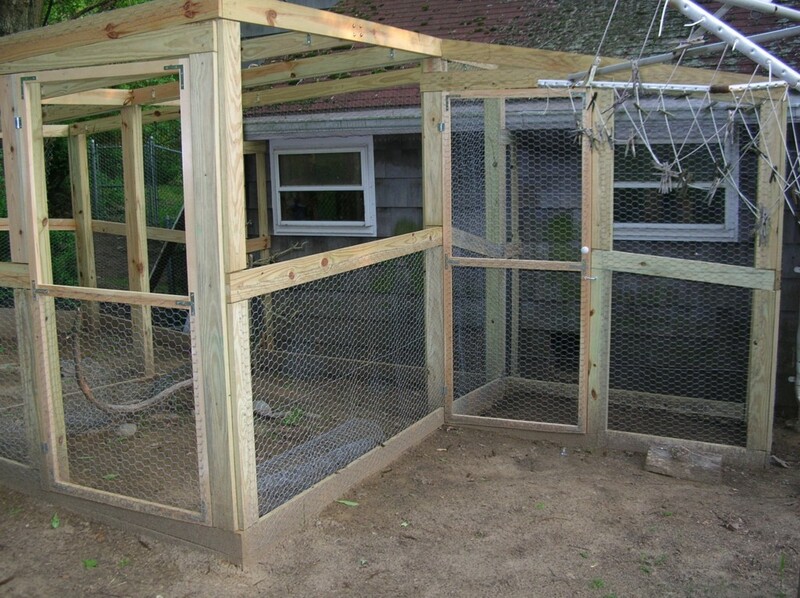 The roof panels were constructed like the doors: a simple frame constructed from 1"x2" wood, braced with L brackets and T-pieces (left), and covered with chicken wire (right). 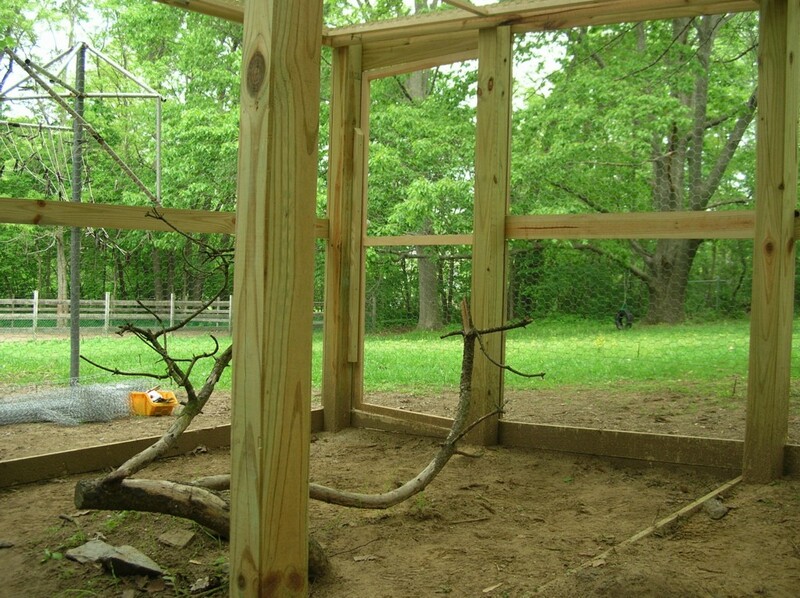 The finished version, from the chicken's point of view.